As a committed non-flyer, Amtrak has played an important role for my travel experiences across America. For me to travel for a cruise from non-Florida cruise ports, an overnight Amtrak train is needed. That’s how I became so familiar with Amtrak sleeping accommodations. There are two types of Amtrak sleeping accommodations: a roomette and a bedroom. While both have beds, they are two different entities. There are also two different types of sleeper cars which have totally different train car equipment and sleeping compartments. Let’s look at the two different long-distance train types: the Amtrak Viewliner and Superliner. Amtrak Superliner deluxe bedroom with private bathroom. Viewliner trains operate mainly along the Eastern Seaboard. Because of its lower height, Viewliners can fit into the many tunnels along this route. There are a few Viewliner trains on the east coast that travel westbound and their sleeping accommodations are always sold out well in advance. There’s the Cardinal that runs between Washington, DC and Chicago, the Crescent traveling between New Orleans and New York City and the historic Lake Shore Limited between New York City and Chicago. The Viewliner is a one-level train and offers compartments that will sleep two or more passengers. A Roomette sleeps two passengers, a Bedroom sleeps two and maybe a very small child and a wheel chair accessible bedroom will accommodate two passengers. Two bedrooms can combine to become a bedroom suite that will sleep four people. A Viewliner roomette has a picture window with two wide, reclining seats that face each other. In the middle of the seats is a pull-up table that unfolds. There’s also an upper bunk with its own window and basket for reading glasses, etc. Right next to one of the seats is the “bathroom”. This consists of a fold-out sink with hot and cold spigots, a mirror, a rack for soap, tooth brush and wash cloth. There is a small luggage storage bin up and across from the upper bunk. An Amtrak Silver Star roomette. That’s the toilet with the pink lid cover. The toilet is right there, too, next to one of the seats. If you’re traveling solo, it’s no big deal. If two people are traveling in a roomette and modesty prevails, one person may choose to step outside while the other, well…you know. Privacy curtains have Velcro fasteners and there’s a flip-over lock for the door. There are two electric sockets with 120v, close enough to be able to charge your laptop while working on the pull-up table. Unlike in Europe with keycards for entry, on Amtrak your compartment door does not lock from the outside. The good news is that your car attendant seems to know who does and does not have a reservation for a sleeper and keeps an eye out for trespassers. Europeans, used to having their compartment locked when they leave it, are usually a little flustered at first. But it all works out fine. If you can afford a bedroom, go for it. 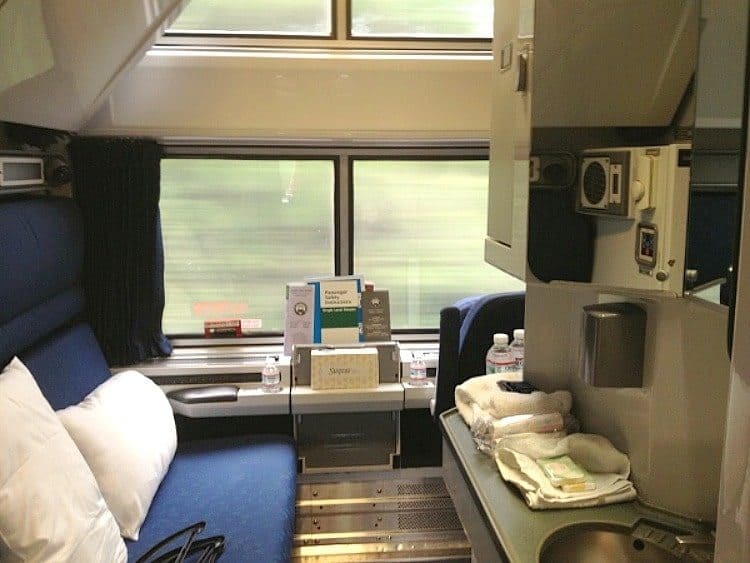 With plenty of room for your luggage, two people can travel in comfort in an Amtrak bedroom. As you enter the bedroom, there’s a fold-out, full-length sofa (a smidgen wider than a twin bed) that runs just about from the doorway to the window. Above it is a drop-down bunk bed. Across from the sofa is a petit sink and countertop, with room for your toiletries. Facial tissue is provided (in the roomette, too) as well as wash clothes, hand and bath towels and soap. Superliner bedroom. Pretty much the same as on a Viewliner. Except for compartment “C”. Smaller than “A” and “B”. Best of all, there’s a private bathroom with a shower. It’s not big and the shower is above the toilet. When securely closed, it works great. It’s really nice after an overnight train ride to arrive at your destination totally refreshed. This is the en suite bathroom in a bedroom compartment, on both Viewliner and Superliner. Bath amenities are on the ledge next to the towels. Opposite the door to the tiny bathroom is a small fold-up chair with storage rack and hooks above it. This makes it possible for two people to sit by the window facing each other. The door locking system is the same as the roomette. At one end of each sleeping car on a Viewliner is a public shower room. Able to accommodate only one person at a time, your car attendant will have it stocked with fresh soap for each person and neatly folded towels. There’s a laundry basket where you can toss your used towel and wash cloth. Every sleeper car has a shower room. The attendant has even made a pretty flower with the wash cloth. The second of Amtrak’s overnight long-haul trains is the Superliner. This is Amtrak’s iconic double-decker train that operates mainly everywhere else across the USA except the eastern seaboard, because it is too tall. One east coast Superliner exception is the Capitol Limited between Washington DC and Chicago. The remainder of Superliner overnight trains head west, except for the Texas Eagle which runs north and south between Chicago and San Antonio. Here’s where the Superliner and Viewliner differ. Aboard the Superliner, compartments are on two levels and roomettes on the Superliner do not have an en suite sink or toilet, as they do on the Viewliner. Viewliner accessible bathroom in the compartment. On the lower level of the Superliner you’ll find four roomettes plus a family bedroom at one end of the car and an accessible bedroom at the other end. It’s on this level that there are three private bathrooms, each with sink and toilet and one separate shower room. Paper towels are available or your can bring towels from your compartment if you’re just using the bathroom to wash your hands. Upstairs you’ll find both roomettes and bedrooms. The four bedroom sleepers have their own enclosed bathroom. For the ten roomettes there is only one public bathroom on the upper level. Occasionally, I’ve been in an upstairs roomette when there were two public bathrooms. But it’s not the norm. If you want a roomette, how do you decide which level of the Superliner is best for you? If you’re on the upper level, the train ride is quiet and amazingly smooth. But, as I mentioned above, there is only one bathroom to share with nine or more other roomette passengers. If you’re in a roomette on the lower level, you will feel the train movement and hear the clickety-clack of the wheels. But, on the lower level you have access to more bathrooms and the shower room. For those who have difficulty walking, they may prefer the lower level to not have to climb the staircase to the second level. Very convenient if you’re on the train for two or three days across country. No matter which Amtrak sleeping accommodation you choose, all of your meals are included in the dining car for the entire journey. The exception is the no-dining-car Silver Star train between Miami and New York City; no meals are included. Also included when you purchase an accommodation are complimentary bottled water, coffee, tea and juice, turn down service by your room attendant, individual climate control, soap, towels and tissues. Rather than sit up all night in a chair in the coach car, opt for a sleeper. You’ll never go back to sleeping in a coach seat again! Have you ever traveled overnight on Amtrak? When you go, here are my 29 best tips for an Amtrak overnight train. Amtrak sleepers have lower beds…both the roomette and the deluxe bedroom. Yes, both also have an upper bunk but you should have no probably with the lower ones. Thank you for your comment. I hope this helps. I wish that Amtrak long distance trains would have the bedrooms similar to the Transcantabric train in Spain, no bunk beds and a choice of single beds or double bed. I love to travel on a train but at my age is very difficult trying to get on the upper bunk. Do not take me wrong, I will take the trip anyway. Sorry, I can’t answer your question. I guess you’ll have to call AMTRAK and ask the reservation person to look at the train’s diagram. Have a good train trip! You certainly made the right decision. I can’t imagine someone 6’5″ in a roomette let alone sharing the space! This will really be a great birthday surprise! Have fun! It’s a beautiful route. Contact Amtrak to help you with your reservation at 1-800-USA-RAIL. On the eastbound you want to be on the right-hand side of the train so you are on the same side as the Colorado River. On the way back, you might want to stay on the right-hand side to see what you might have missed. Of course in the Observation Car, you have both views! Have a wonderful train trip! I think I’ve done the right thing by booking a superliner bedroom as opposed to a roomette for my hubby’s and my 24 hour trip coming up on the west coast. He’s 6’5” and stretching his legs out is necessary and I don’t think he’d be able to do that in a roomette. I will be relegated to the top bunk as I’m 5’4”; lucky for me I’m not claustrophobic! PS: He thinks we’re going to be in coach! It’s a birthday surprise. I would like to take train from Martinez calif to the Denver area or there about just for fun, in a sleeping car, and return to Martinez. Is this possible and if so who might I contact to make reservation ? I would love it if you can get me started. I’m happy to explain – it’s a common question. Everyone pays a base Rail Fare. Sometimes there are discounts, like Senior or Student or even a sale rate once in a while. Then you price your sleeping accommodation, a once-only price. Meaning, if there are two people in a deluxe bedroom, each passenger pays a Rail Fare and then the cost of the sleeper is added and the cost doesn’t matter if you have one or two people in the sleeper whether it’s a deluxe bedroom or a roomette. So it’s one Rail Fare per passenger and then just add on the cost of the sleeper. I hope this helps. Have a wonderful train journey wherever you’re going! Was wondering if you could explain to me howit works when ticket buying for a bedroom. Do I have to pay base rail fee for for each passenger and then 1 elevated sleeper car fare, or do I need to pay the elevated sleeper car fare for each passenger that will be sleeping in the sleeper car? Thanks! I am a novice. Thank you for reading my blog. Yes, it is definitely possible to use your CPAP machine on the train. If you have a roomette on a Superliner (the double-decker trains) there will be an outlet near your seatback which is turned down to become your bed. On the Viewliner trains, it’s above the sink. If you have a bedroom on either type of train, there will be an outlet above the seatback (sort of a sofa) and also at the sink. My concern would be if power were lost on the train, though it rarely happens, would you be okay? I hope this works for you. A few years ago I was on an overnight train on Dec. 25 and 26 and everyone was in a great mood and the dining car was a lot of fun. I hope you are able to go and if so, have a wonderful time. Thank you again for writing. I am thinking about taking a long train trip over Christmas either to Niagara Falls or the other direction to Seattle. This site has been helpful! I do have a question on the sleeper bedrooms – I sleep with a CPAP machine and need a plug in relatively close to a bed. Do you know if that would be possible? Thank you! Sorry to hear you were uncomfortable in the upper bunk. It’s a bunkbed so headroom is pretty much limited. My daughter and I shared a bedroom on the Zephyr last summer and she had the upper bunk. But she was only up there to sleep and not try to sit up in bed and she was fine. Like any top bunk you have to duck getting in and out of it. So, yes, this is true of all Superliner trains. And it’s the same with Viewliner roomettes. Those are just as small with very limited head room if you’re “upstairs”. One solution is to buy two roomettes across the hall from each other so both of you can have a lower bunk. There’s really no other alternative. Top bunks aren’t meant for sitting up and relaxing. My husband and I just returned from an Amtrak trip on a Superliner from Chicago to Whitefish, MT and back. We had a roomette. I’m 5″3 and I had a lot of difficulty being in the upper berth due to lack of headroom. I had to stay hunched over until I could get into a sleeping position. Also the foam pad/mattress was very thin and uncomfortable. I don’t see how having a bedroom would have helped as far as having more headroom. Is this true of all Superliner trains? I don’t recall this being an issue on the 2 Viewliner trips we took but understand that they only have one level to get through tunnels not two. I would appreciate any suggestions as we would like to take more Amtrak trips west. Thanks for your reply! I think you’re on the right track (sorry for the pun!) with taking the architecture boat tour. You can take the bus or an Uber or Lyft to Lincoln Park Zoo, the only free city zoo in the USA. Then walk up to Clark street and there are a zillion restaurants and pubs. Be sure to spend time at the Millennium Bean in Grant Park and walk around the grounds. So much to see and do. Early May can be a beautiful time in Chicago. Also, a walk along the River Walk downtown is a lot of fun and you can walk all the way down to the lake. And don’t miss a stop at Lou Mitchell’s for a bit of old Chicago. Have a wonderful visit and a great cross-country train ride! Oh! I almost forgot. Be sure to watch for river rafters on the Colorado river…you’ll find out why it’s called Moon River! It might be a little tricky to call from Australia but we shall give it a go. We are spending two nights in Chicago before taking the train down to Washington DC. Will definitely try the restaurant you have recommended. Might be perfect for lunch before we get the train to Washington. We will have one full day and a morning in Chicago. Any suggestions for ‘must dos’ are welcome. I am a bit of a Frank Lloyd Wright fan (and architecture in general) so we are thinking one of the River Architecture tours and possibly a lake tour. We love culture, food, and just wandering around. We can walk for hours! We will be there in early May. I know – I am an early planner! My partner has always wanted to travel by train in the States and it will be my first time in the USA – so we are really looking forward to the trip. Thank you so much for your kind words. All sleeping accommodations are by reservation only. If you can, I would suggest calling Amtrak at 1-800-872-7245. When you reserve your roomette, ask the reservationist to tell you if the roomette is upstairs or on the lower level. If you don’t get the response you want, hang up and call back. I don’t think you can choose upper or lower if you book it online. Also, the ride on the upper level is much smoother than downstairs. Something to consider, unless mobility is an issue. In that case you could request the accessible stateroom and that is downstairs. There is limited availability so the sooner you know when you want to go, the better your chances to get a lower level sleeper. Keep in mind that the dining car and observation car are on the upper level. Have a wonderful train ride. When you get to Chicago, and if you’re staying overnight, there’s a great restaurant for breakfast or lunch and right across from the train station. It’s called Lou Mitchells and is a real bit of Chicago history. Chicago’s my hometown so if you have any questions, please ask. First of all can I say thanks for going to the effort of having a website like this. I am always impressed by people who are so willing to share their experiences and knowledge with others so freely. We are travelling from Australia next year and plan to do the California Zephyr from San Francisco to Chicago. We will be travelling in a Roomette, but I was wondering if you are able to reserve an upper or lower level room, or is it allocated on a ‘first come, first served’ basis? I have searched the Amtrak website but there seems to be no mention of this. Sorry for my late reply. My best suggestion would be to contact Amtrak. I’m not familiar with Princeton Junction and if it is just a flag stop or a scheduled stop. Amtrak can advise you on that issue. Either way, have a great train ride to Florida! Sorry for my delayed reply. Thank you for your kind words! I think you’re onto a great travel idea. To answer your first question, coach pricing might display two different rates if one is for business class. There are three tiers of prices on Amtrak, based mostly on what’s left in inventory and how early you can book your accommodation or reserved seat. Your idea for a rail pass, sometimes adding a sleeper or other times in coach is something I’ve also investigated. There are three lengths of rail passes; 15, 30 and 45 days, with 8, 12 or 18 segments, respectively. Except for the Acela trains in the Northeast which might or might not allow rail pass users, I fairly certain that of the 500 station stops for which rail passes are valid, that you won’t have any issues. I would suggest calling Amtrak and if the first person who answers your call isn’t quite sure, politely hang up and call back in a few minutes. The more experienced the Amtrak reservation person, the more tricks of the trade they can share with you and in my opinion, it’s well worth the extra callbacks. Have a fabulous time on your next long-distance journey! The Texas Eagle could be an endangered (train) species, so I would not hesitate to hop aboard for your roundtrip to Ft. Worth. If it’s within your budget, definitely go for the deluxe bedroom. The bottom bunk is nearly as wide as a double bed and having your own bathroom is so worth it. As far as personal safety, it’s of course up to your comfort level. For me, I’ve never once, in over 50 years of overnight train travel, felt unsafe for myself. Your accommodation locks from the inside so that might help you feel safer. I’ve met some wonderful passengers aboard Amtrak and we’ve kept in touch for years. If you decide to go, I hope your have a wonderful time. Hi Staci, sorry but I don’t help with roommate matchups or quote roomette rates. Please call Amtrak for pricing. Very true. Reserving an accessible room is important if mobility is difficult. In roomettes and bedrooms, the lower berth is easy to access, though. Also, a family bedroom has two lowers. Thank you for your comment. Hi Miranda, thanks for writing. With six people, you could get either three roomettes (2 in each) or two deluxe bedrooms and two small kids could share the lower bunk and you or your husband could sleep in the upper bunk. You could look into Amtrak Vacations (not owned by Amtrak) as they offer packages to the Grand Canyon. Otherwise, you idea to book your own stay there at the end could work well. Either way, kudos to you and your husband for wanting to take your foster kids on a grand adventure! Thanks for writing and have fun. Hi Paul, if you plan to get a sleeper, you would need two roomettes or deluxe bedrooms, unless you have infant twins. Everyone loves a train ride. If you choose to go, think about booking on the Silver Meteor rather than the Silver Star so you will have a dining car. Trains are more expensive than economy air fare, so if it’s in your budget, you might think to try the train. I just have a question…i live in NJ and would like to take the train to Miami, it would be my wife and two children, i have never taken the train before other than the subway system in NYC. WOuld it be worth taking the train or going by plane? Hi my name is Miranda. I am a Foster parent and would like to take the kids (4) plus myself and the hubby to see the grand canyon possibly see plains and or sights along the way (couple of the kids love Little House on the Prairie) we are from North East TN. What is the most economical way for us to do this? Should we do a vaca package or book the route we want and add the grand canyon at the end? Also, the sleeper car they only hold 2? No more? Could we squeeze 3 ? I hate the kids sleeping alone like that. You’ve booked three Amtrak trips! When making connections, anything one hour or less is not guaranteed by Amtrak. I would suggest that you phone Amtrak and ask them if all of your connections are guaranteed. Certain routes have a 2-hour guarantee window. There is always a chance that freight trains could delay your Amtrak train. I’m pretty sure that the Coast Starlight in LA waits for the Southwest Chief. Again, please call Amtrak (1-800-USA-RAIL) and when “Julie” answers, press “0” and then another “0” to bypass all the menu options. If you need to overnight, check on Google for “hotels near Amtrak station in XXXX”. Portland and Los Angeles both have First Class lounges…but I’m not sure that they’re open overnight. Have a wonderful trip! Thank you for reading my Amtrak articles! Bus transportation is not possible for me, and I’m afraid “overnight accommodations” means a light blanket or a pillow in a waiting room chair! How and where do I find out something definite about this? Thank you! Your site is most helpful! Stop stealing content and images from here. People who have difficulty walking or climbing into befs should probably think about another form of travel. Amtrak beds are bunk style (except in disabled rooms). I’m thinking about taking the Texas Eagle from Chicago to Fort Worth and back. I’m 58 and never traveled alone. I’ll either get a roomette or bedroom. I’d prefer bedroom because they have a toilet and shower. (I think!) How safe is train travel as far as other passengers…not the crashing part! I absolutely adored my cross country trip on the Empire Builder so I am planning another cross country trip for next summer. I am considering several trains: California Zephyr, Texas Eagle and Southwest Chief. I am wondering if I could stop in some cities and board the train one to two days later. On some parts of the trip I could take coach seating and on others a roomette. I have two questions: on the amtrak website, there are often 3 different prices for coach seating on a train, with apparently no difference of service. Am I missing something? And my second question is can I take a sort of rail pass, if I want to hop on and off, 😉 Because from what I understand the multi-ride and rail passes are not offered on every train. But perhaps I am mistaken? Your article and answers are remarkable ! If you are booked on the Silver Meteor then yes, the dining car is there, so you don’t need to bring your own meals. Enjoy the trip! I’m booked in a Viewliner roomette on the Silver Meteor next week. I board in Savannah at 7:30 pm. Is there a dining car or no? Do I need to bring my own meals? I hope I can answer your questions. You certainly could reserve a wheel-chair accessible stateroom and it would have an en suite bathroom. On the westbound trains, only deluxe bedrooms and the accessible stateroom have their own bathrooms. There is one very small bathroom on the upper level; otherwise you and your father would have to negotiate a very narrow, winding staircase to use the facilities. Overnight train travel in a sleeper can sometimes be the equivalent of business class air travel. With a little flexibility with time, as you said you did, you can scout out the lowest-cost date to travel. Regarding your luggage, you’re allowed to check two pieces of luggage up to 50lbs each, plus your carry-on bags. A lot of people choose Amtrak when they move to a new destination because of their liberal, complimentary baggage handling allotment. Please call 1-800-USA-RAIL for more information. Everytime “Julie” asks a question, just say “agent” and you’ll go directly to an agent. My elderly father and I need to get to Ashland Oregon sometime in the late fall, early winter. We are very flexible on dates and times. I have a legal disability that my doctor certainly would recommend a roomette. Since we are flexible on are dates can a roomette be cheaper than flying? Trying navigate the website, entering different dates and such, was an ordeal. Is there any easier way to do this? Also, this trip is to move me to Ashland. Will I be allowed (using my dad’s luggage allotment too) to carry on two trunks? Along with my suitcase? Thank you so very much. Thank you for your question. You’re best bet is to all Amtrak at 1-800-USA-RAIL. There isn’t a bedroom for four but actually is two deluxe bedrooms with an adjoining sliding door. Each has its own en suite bathroom. There are four bedroom per car. So that would be eight people total. With 12, you’ll have to split up. Usually, there are several sleeper cars so you should all fit. Then you can meet up in the observation lounge and the dining car. Also, there’s a family bedroom downstairs, but there’s a really short kid’s bed! The reservationist at Amtrak will be able to get this figured out for you. Happy ‘Rails! It’s nice that you’re traveling across country with your mom, so she’s not alone. You’ll need to contact Amtrak at 1-800-USA-RAIL. Since there is only one accessible bedroom per train car, the sooner you make your reservation, the better. Tell the reservation agent your situation. The accessible bedroom is on the lower level and has its own bathroom facility. The Family Bedroom is also located on the lower level but does not have its own en suite bathroom. Up the winding stairs are the smaller roomettes and deluxe bedrooms. The bedrooms upstairs also have an en suite bathroom, not the roomettes, though. Being flexible in your travel dates will be a huge help. Be sure to ask for the senior discount on the rail fare portion for your mom. It’ll save a little bit. Have a wonderful train trip! The route is spectacular. Traveling with my mom from Sacramento to Chicago, Calif Zephyr; she is old and has mobility issues, I can decide on which bedroom, family bedroom, or if I can get the Access bedroom, what is the big difference and how do you get the bigger handicap bedroom? The bedroom “couch” is divided in two and each section also reclines like the seats in the roomette. The bedroom also has a little chair but it’s not the most comfortable but provides a change of pace. Are the bedroom seats are more or less comfortable then the roomette seats? It looks like the roomette seats recline a little where the bedroom “couch” seems more upright. I hope you were able to come to a decision about your Amtrak adventure. For future train trips, you might want to study the Amtrak Rail Map and get ideas as to what is convenient from your departure city. I have been planning to take amtrak as a means to travel for pleasure trips. I’m looking for a trip from Richmond (VA) to Pittsburgh (through DC of course) in coming week (26 Apr to be precise). The its very lucrative to rent a car and do the round trip which is a 7 hrs drive one way. But, felt like trying this journey with Amtrak instead, but my dilemma is not letting me do the clear choice. I will be travelling with my wife and a daughter (6 years old and important person to be considered on preferences and choices etc…..like other kids, for sure) . It take 2 hrs from Richmond to DC and after 2 hrs halt, 29 Capitol Limited departs (4:05 PM) from DC and takes 7 hrs to reach to Pittsburgh (11:48 PM). Coach booking (142$s) is really reasonable no doubt, however, 2 roomette or 1 family bedroom, bumps the price very high (542$s). And then Rental shops are closed at the time we reach (11:48 at Pittsburgh), so taking cab and going to hotel and then renting a car next day which would be one way to Richmond after 2 days costs equal to entire 3 days rental if I choose all of it by rental. So, really need the thoughts on choosing between Amtrak and drive for this journey and if Amtrak then – Coach class is good as we are not going to exactly spending entire night, because the daughter will be sleepy during some portion of the night. Bedroom type price seems to be higher for a segment journey. What do you think and advise on my situation. I’m also open for any other Amtrak journeys to spend a coming long weekend at a destination on EASTERN region, as I mentioned my departure is from Richmond. Thank you in advance for your advice….too many parameters I guess …sorry. Sure, I’ll try to help. Have you phoned Amtrak reservations? Online isn’t the best way to go…everything you’d need to know is there but it’s several layers deep and not easy to find. I would recommend two separate roomettes and if you book early, they could be across the hall from each other. If money is no object, you could get connecting deluxe bedrooms. That would give you two en suite bathrooms as well as two oversized lower twin beds. I might think that a family bedroom on the Superliner (double-decker train) could work if one of you is short. There are two lower beds – one is 6’3″ long and the other is 4’9″ long. I really think that two roomettes across the hall from each other would be the best. You can call 1-800-USA-RAIL for reservations. When “Julie” answers, you say, “Agent”. Repeat “Agent” each time Julie asks you a question. You’ll get a reservation agent who can check various dates, too, for the lowest rates for your two trains; one from Pittsburgh to Chicago, and then Chicago to San Francisco (actually Oakland but they transport you to San Francisco). Have a wonderful trip! Amtrak ‘s website for information, way too confusing. We’ve never done this before. Would like to know the price for this trip. Can you please help? Thanks for your comment…and I couldn’t agree more with you. Happy travels! This is my preferred form of travel now. No TSA or cramped airplane seats to deal with. Every Amtrak ride I’ve had has been thoroughly enjoyable and relaxing. These cross-country trips are great to see the country from the ground rather than 30,000 feet in the air too! I understand your predicament. What about two roomettes across from each other? If the timing is right, the cost could even be less that a deluxe bedroom. You won’t have a toilet or shower in your Superliner roomette, though. If walking is becoming an issue, I’d suggest that you speak with Amtrak about their accessible stateroom. Thank you for your email and happy travels! Found this article very informative. Thanks. My husband and I are planning our 5th long distance train trip. We are both in our early 70s and have some difficulty walking and climbing stairs. We would prefer to book a bedroom because of the easy bathroom access in the middle of the night. However, we have yet to manage the upper berth so end up sitting most of the night because the lower berth is too narrow for 2. We are considering lower level coach seats for this next trip on the Capital Limited. Any thoughts? The train is the Coast Starlight and it’s a Superliner (double-decker). There would be more leg room in the larger Bedroom accommodation, though that tends to be much more expensive. Since it’s scheduled to be only an 8-hour trip, I’d think you’d be find in a roomette. There’s always the dining car (meals included with accommodations) and the observation car to walk around and stretch! Plus, there are a couple of “fresh air breaks” along the way, too. Have a fun train trip! I have a question…. My boyfriend and I are traveling from Santa Barbara Ca. to Oakland Ca. about a 9 hour trip. He is 6’2″ I am 5’4″. We booked a roomette to have more space than a coach seat. We will NOT be sleeping on this trip. Will a roomette give us enough leg room for him or would a bedroom be better? Also will we have a viewliner or a superliner on this route? Thank you for sharing your unfortunate experience. I used to live in Cincinnati for a few years and the train schedule is awful with the middle-of-the-night arrival and departure. But…somewhere has to have the bad timing. There’s no way around it either. Back then, Union Station was closed down. And now with the latest refurbishment, they are back to using a temporary location. And about the delays on the Empire Builder into Chicago, there’s nothing we can do about it until Amtrak has its own tracks…and we know how that’s not going to happen any time soon. I hope your next Amtrak ride is as good as you remember your older one. Happy ‘rails! To anyone planning to go from Wisconsin, through Chicago to Cincinnati, this was not a very pleasant ride. The route to Chicago is usually late because the freight train from the Dakotas (long oil train has presidents and Amtrak has to wait on side track.) Missing our connection, the Chicago station is not great to have to wait for next train. Our bags had to go in our car. At Cincinnati station, (by this time it was in the middle of the night), there was no one to help us off with our bags, except another traveler, and to tell us how to get to the station. Someone mentioned a ramp, so we tried it and it was actually a ramp for trailers taking luggage. (Very difficult to go up on.) No one was in the station. However, I have had experiences on the Empire Builder to Seattle and the California Zepher. quite a few years ago. Both were fun and comfortable. My feelings are that West trains may be better than East. We slept in our seats reclined but we were younger then. We took a pillow and small blanket. Our bags were at the end of the train on a shelf so they were easy to get to for clothes changes. Everyone pays the base fare (rail fare). If a sleeping accommodation is not added, this would be your coach rate. The rail fare may be available at a discount such as a Senior Rate, AAA, Student etc. The price for a sleeping accommodation is then added to the rail fare. That’s the $220 price that you see. Hope this helps. I’m confused on the booking site prices. Coach shows $72.00. Roomette $138. When I change to Roomette from Coach it shows $220.00. So the coach is a base price and any other choice is added to the coach price? I find the mattresses in the sleepers to be comfortable…and lean more towards the very firm category! Hope this helps. Hi we are booked on the Auto Train in a roomette and was wondering about the mattress on the train. The last time I traveled on the Auto Train the mattresses were hard. Are they still? Hi Lois – thanks for your comment and reading the article! Have a wonderful overnight train trip! Hi Sherry! Thank you for the great tips, and the info. I love to travel, but I’ve never taken a long distance train ride. I had decided to travel by train from New York City to New Orleans, (my Aunt’s 90th birthday celebration) for the long distance sleeper car experience. I have a Viewliner roomette reserved on the Crescent. I’m looking forward to this new adventure. Thanks for your email. Unfortunately, Amtrak no longer prints their National Timetable. I would guess that it’s part of a cost-cutting measure. The one I have it at least three years old and I panic about misplacing it! The best you can do now is to individually print out the schedules online or call Amtrak and see if they can send you any of the individual schedules. If you happen to live near an Amtrak station, you can look for the individual schedules, too. Thanks for your question. My kids loved going on overnight trains (as I did, too). But they were older and able to sleep in their own bed in our roomette. Unfortunately, the width of the roomette bed is pretty darn narrow, not even the size of a standard twin bed. Your 18mo old is definitely too tiny to sleep in his own berth and in a roomette there’s no room for a portable crib. I can’t imagine squeezing a grownup and an infant to sleep in the roomette-size bed. If you can, I’d suggest holding out for a bedroom. The lower berth can accommodate an adult and a very small child as it’s actually a bit larger than a twin bed and with the baby on the inside against the wall, you don’t have to worry about him falling out. I hope this helps. Have a wonderful train ride! Amtrak National Timetable where do I order one ? Hi Sherry….. just curious about your opinion on something. Like most young boys, my 18 month old son has hit the fascination with trains stage so instead of flying back to miami from Philadelphia I’m strongly considering the silver meteor back and actually have a roomette reserved. There were no bedrooms available the days I was looking to go back so I’m curious if, A) do you think a typical 18 month old will enjoy a trip like this and B) is a roomette big enough for the 2 of us? Again, just looking for a top of your head opinion. Yes, if there is availability (which is getting more and more scarce en route) you can upgrade. Let your conductor know that you’d like to purchase an upgrade. He or she will have to check with Amtrak and you should be able to purchase it with a credit card. Even a ballpark guesstimate on the cost of a sleeper is tough. Prices vary immensely based on time of year, route, how many overnights etc. But I think it’s safe to say that the least expensive sleeper (roomette) will add no less that $200 to your rail fare cost for one night. I hope this helps. Thanks for your comment. Good information, can a traveler upgrade from coach to sleeper enroute? Your article is great, some ballpark pricing on the roomette vs the sleeper would have made it excellent. I know you have the Amtrak contact info, yet i find dealing with them cumbersome. And the Amtrak website is not so intuitive. Please contact Amtrak at 800-USA-RAIL or visit Amtrak.com for pricing. It varies a lot depending upon how far in advance you book your sleeper. What is the price of a sleeper? The articles give lots of information but no prices. Your shortest route would be from Seattle to Chicago on the Empire Builder. Connect in Chicago to either the Cardinal or Capital Limited to Washington DC. Once in DC, you can take either the southbound Silver Star (no dining car) or Silver Meteor. Both trains stop in Rocky Mount, NC. The Silver Star goes on to Raleigh and Cary, while the Silver Meteor goes straight from Rocky Mount to Fayetteville. So depending on your destination in NC could determine your train. If you go to Raleigh, you can arrange for a rental car to pick you up. There’s also a nearby Marriott hotel. Have a nice train ride and Happy ‘rails! I want to take a vacation on the train. I want to leave from Seattle to NC to NY. I am having a difficult time figuring out how this is possible. My sister and I would leave from NC to NY. Could you tell me who I can talk to that can help me plan this trip?. That’s great! Thanks for reading – and have a wonderful experience on Amtrak. For sure! When I have an upstairs roomette, I always go downstairs to use the bathrooms. That’s why I recommend a little “ditty” bag (Girl Scout lingo) that contains whatever you need to get ready for bed or in the morning. I also bring a washcloth or if there isn’t one in the roomette, I ask the attendant. Thanks for your comment! Happy travels! One point about the shared bathrooms in superliner sleeper cars. Though there is only one bathroom upstairs, any sleeper car passenger can use the downstairs bathrooms if they want to – for example, if the upstairs one is in use. I’ve done that frequently. There’s just more bathrooms downstairs because there’s more room for them there. 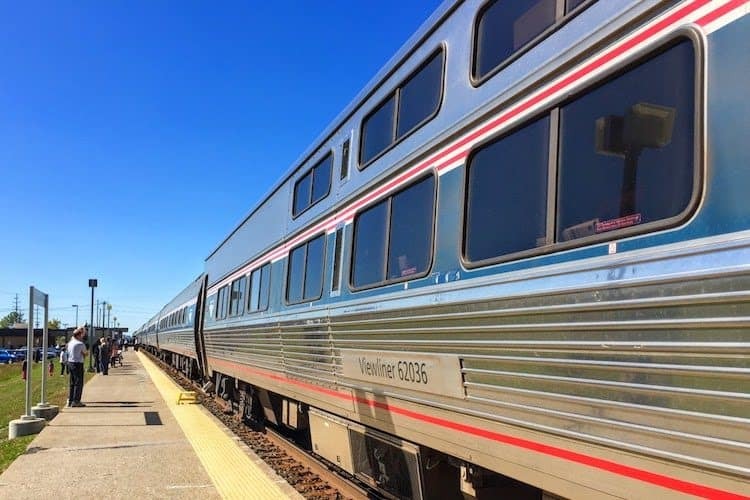 A cross-country trip can be tricky to plan, especially if you’re not familiar with all of Amtrak’s long-distance trains and itineraries. A travel agent who is knowledgeable about Amtrak could be a tremendous help to you. I would suggest ordering an Amtrak National Timetable (an actual paper brochure!) as it really helps in planning…I still use one! Keep in mind that the further out you book, the better the pricing on accommodations. Have a wonderful journey on the train! Is it better to get a travel agent for cross country? Prices hard to predict, plan for summer 2018. Ideas? My two cents worth on Superliner Roomettes…I am a plus size woman, 5’7″. Hubby is average size & 5’6″. I am claustrophobic to the point of not even being able to watch cave-type movies! We went from southern Wisconsin to NW Montana in a roomette, about 27- 28 hrseach way. Regular bedrooms were too expensive. I didn’t have any problems at all with claustrophobia in roomette. I did sleep on bottom bunk and kept curtains open to outside & slept facing window. We had 2 large-ish duffel bags, large purse, & small cooler with us & could’ve fit 1 more bag. The shared bathrooms were a little tight for a claustrophobic person, but I just focused, hurried, & got out. Bravo! I’m with you 100% on this subject! No need to fly. It just takes a little longer…and can be part of your vacation. Thank you for your comment and happy travels! While it’s great to save quite a bit of money on the Silver Star, it can feel a bit confining to not have the dining car to visit 3x a day! You will find an Amtrak Café car with several tables/booths. I just rode the Silver Star for the second time and I brought a small $1.99 styrofoam cooler. I packed a few frozen water bottles (they last longer than those blue ice packs) and filled it with food for the trip. I supplemented meals with little bits from the café car just to get up and around. After the train ride, I emptied out the cooler and offered it to my car attendant or for anyone who might want it. Have a terrific train ride! Thank you for your comment! I’ve slept in a Roomette and in a Bedroom and as a larger person and as a disabled veteran, I have to say the bedroom berth was just a tad wider, however, my husband and still I had to sleep in separate berths in the bedroom. The Roomette is fine if you are by yourself but two people who are either bigger or older or have mobility issues are going to be more comfortable in one of the bedrooms. We have found, however that it is perfectly possible to take the train cross-country in bedrooms for less than the price of either first class air or 3 economy seats, which is what we would have to book so that we and our fellow passengers would be more comfortable. *and* it includes meals and turn down service. As larger folk we are acutely aware of trying not to make others uncomfortable. And that is hard to do in airplanes. Trains are just so much more sensible. We have also found that it is perfectly possible to book passage on Cunard’s QM2 passenger liner for less than first class air or 3 economy seats on an air plane. And we get our own bedroom with a King bed. I don’t know why anyone flies anymore. Hi, Sherry – We are traveling on the Silver Star to NYC soon, and have reserved a roomette. We understand there is no diner car, but wondering if there are other cars such as a lounge or observation area where we can relax outside of our roomette for a while. Thanks for the great articles that are preparing us for our trip! I’m so glad my article was helpful to your vacation planning on Amtrak. Enjoy the journey! Thank you for your comment. Thank you so much for this information and the photos. We are traveling from ‘Texas to Virginia soon and have reserved sleeping accommodations for the first time and all information is so valuable to us. Have a great trip! I’ve done something similar…go coach for a segment and then move into a sleeper when the price is less. The scenery through New Mexico is beautiful. Thanks for your comment. Thank you for the info! I’m planning our vacation for next summer. Dallas to LA. Four adults, so I’m think to save money, will go coach to San Antonio and bedroom from SA to LA. Hi Doug, It’s a totally different experience in a sleeper overnight than in coach. But we’ve all done an overnight in coach. Once. Thanks for your comment. It’s on my bucket list to take a train across the country. The longest I’ve ever taken a train is between Baltimore and Savannah, Georgia – in coach – it sucked!